Douglas Natelson, the author of Nanostructures and Nanotechnology, takes on the controversy of nanoscience. One of the most profound concepts to come out of condensed matter physics is the idea of emergent properties – nontrivial properties of a system that are not trivially deducible from the microscopic aspects and interactions of the underlying degrees of freedom, and that become even better defined as the system size grows. One example is the rigidity of solids: A single carbon atom is not rigid; a small cluster of carbon atoms has a countable number of discrete vibrational modes; but a large number of carbon atoms coupled by sp3 bonds becomes a diamond, one of the hardest, most mechanically rigid solids there is, so stiff that compressive sound travels at 12 km/s, 35 times faster than in air. Somehow, going from one atom to many, the concept of rigidity acquires meaning, and the speed of sound in diamond approaches a precise value. This idea, that something remarkable, exact, yet not at all obvious can emerge collectively and even generically, is why condensed matter physics is profound and not just “mopping up the details”. This is the heart of Bob Laughlin’s first book, A Different Universe: Reinventing Physics from the Bottom Down, and was articulated concisely by Laughlin and Pines in their “Theory of Everything” paper. I was recently rereading that book, and one chapter articulates Laughlin’s basically dismissive take on nanoscience. He refers to it as a “carnival of baubles” – his view is that otherwise smart people get sucked into playing around at the nanoscale because it’s diverting and involves fun, cool toys (i.e., everything looks cool under an electron microscope! ), instead of spending their time and effort actually trying to think about deep, fundamental questions. Well, everyone is entitled to their opinion, but I disagree with much of that take. 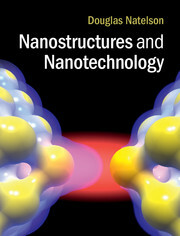 My new book, Nanostructures and Nanotechnology, focuses on the fundamental insights that underpin the remarkable properties of materials at the nanoscale. This fully realized textbook was developed for a two-semester senior undergraduate/first-year graduate level course appropriate for students with backgrounds in physics, chemistry, materials science, and electrical engineering. Working at the nanoscale means understanding the emergence of what with think of as the properties of macroscopic materials, and learning how our ability to structure and engineer systems down to the atomic level can manipulate their emergent responses. Starting with an overview of condensed matter, the book looks in turn at nanoelectronics, nanomagnetism, photonics, micro/nanomechanics, micro/nanofluidics, and bionanotechnology. In each case, the text lays out the basic underlying macroscale physics and how those properties are altered by working at the nanoscale. Current technological applications are described as well as potential opportunities afforded by our recently acquired nano capabilities. Working at the nanoscale allows us to examine how emergence works in specific cases, sets the ground work for the materials and devices of future technologies, and allows us to develop new probes and techniques precisely for asking (some subset of) deep questions. Like being able to probe matter on ultrafast timescales, or over a huge temperature range, or in systems of unprecedented purity, pushing our control and manipulation of materials to the nano regime lets us ask new and different questions, and that’s how we make progress and find surprises. This isn’t an infatuation with baubles (though everything does look cool under an electron microscope).